Here are summaries of ethics opinions issued March and December 2016. 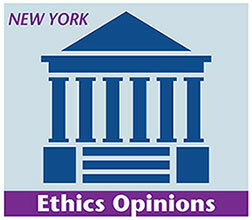 The opinions were issued by the NYSBA Committee on Professional Ethics and the American Bar Association Standing Committee on Ethics and Professional Responsibility. NYLER will continue to provide updates on new ethics opinions issued by these and other ethics committees in New York State. For information about how to obtain an ethics opinion from the ABA Standing Committee on Ethics and Professional Responsibility, please visit http://www.americanbar.org/groups/professional_responsibility/publications/ethicsopinions.html. Opinion 1087 addressed whether a lawyer could charge potential clients a $25 cancellation fee if the potential client cancelled the appointment without reasonable notice. Specifically, the Opinion addressed whether the cancellation fee was permitted under Rule 1.5(a), which prohibits unreasonable fees. The $25 cancellation fee was a fraction of the lawyer’s regular fee for a consultation, which was $150. 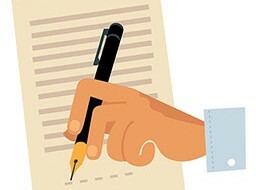 As a threshold issue, the Committee opined that, since Rule 1.5(a) does not expressly reference “client,” its restrictions are not limited to fees charged to clients, but also to potential clients who do not ultimately retain the lawyer. The Opinion then addressed whether the cancellation charge is a “fee” or an “expense.” If it is a “fee”, the Opinion reasoned, it must be reasonable under Rule 1.5(a). If it is an expense, the amount must either “reflect the cost to the lawyer or be agreed to by the client and in either case not be excessive.” Ultimately, the Committee concluded that as long as the charge is disclosed to the client, it appeared to be “reasonable” given that it is a nominal 17% of the lawyer’s regular charge for a consultation and a reasonable lawyer would not be left with a “strong and firm conviction” that the charge was excessive. 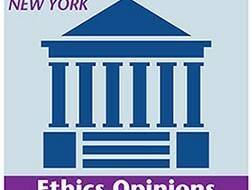 The full Opinion is available at: http://www.newyorklegalethics.com/recent-n-y-ethics-opinions-october-2016. In Opinion 475, the ABA Standing Committee on Ethics and Professional Responsibility addressed how a lawyer must handle funds that the lawyer received which are subject to a fee-sharing arrangement with another lawyer or law firm. As an initial matter, the Opinion, which was based on the ABA Model Rules of Professional Conduct but will be instructive to New York lawyers, reasoned that the fee-sharing arrangement must comply with Model Rule 1.5(e). Under Model Rule 1.5(e), the fee-sharing arrangement is permissible only if the division is “proportionate to the service performed by each lawyer or both lawyers assume joint responsibility for the representation, the client agrees to the arrangement including the share each lawyer will receive, the arrangement is confirmed in writing, and the total fee is reasonable.” The Opinion then addressed how a lawyer must handle funds she receives that are the subject of a duly-authorized fee sharing agreement. The Opinion analyzed Model Rule 1.15, which governs a lawyer’s duty to safeguard property of “clients or third persons that is in a lawyer’s possession in connection with a representation… .” The Opinion reasoned that “if two or more lawyers have an agreement that satisfies Model Rule 1.5 regarding a division of fees, and one lawyer receives a payment that must be divided with the other lawyer pursuant to their agreement, the other lawyer is a ‘third person’ for purposes of Rule 1.15,” and thus not funds the first lawyer may keep for herself. Model Rule 1.15(a), therefore, requires the lawyer in receipt of the funds to “deposit the funds in which co-counsel holds an interest in an account (typically a trust account) separate from the lawyer’s own property.” The Opinion continued: “[Model Rule 1.15(d)] requires the lawyer who receives the earned fees subject to a division agreement to promptly notify the other lawyer who holds an interest in the fee of receipt of the funds, promptly deliver to the other lawyer the agreed upon portion of the fee, and, if requested by the other lawyer, provide a full accounting.” In the event of a dispute over the funds in the receiving lawyer’s possession, Model Rule 1.15(e) requires the lawyer to keep such disputed funds separate from the lawyer’s own property until the dispute is resolved. The full Opinion is available at: http://www.americanbar.org/content/dam/aba/administrative/professional_responsibility/aba_formal_opinion_475.authcheckdam.pdf. The full Opinion is available at: http://www.americanbar.org/content/dam/aba/administrative/professional_responsibility/aba_formal_opinion_476.authcheckdam.pdf.